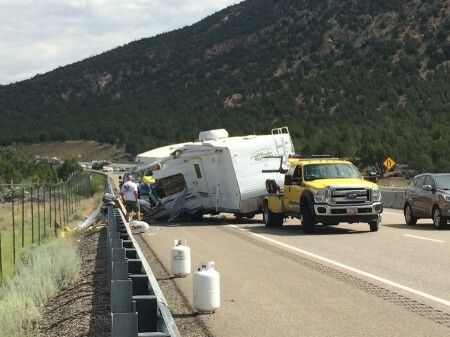 Every two weeks, a camper flips on I-15. This week, the unfortunate souls were traveling from California, heading home after the Independence Day weekend. Thankfully, none of the passengers in the truck were injured, but their camper looks like a total loss. These photos from STGnews show the damage to the camper after it had been put upright. You can see a video of the damage on the STGnews website. As wonderful as our campers are, they can’t withstand the forces of wind from turning them topsy turvy. A little bit of sway can turn into a lot of heartbreak. 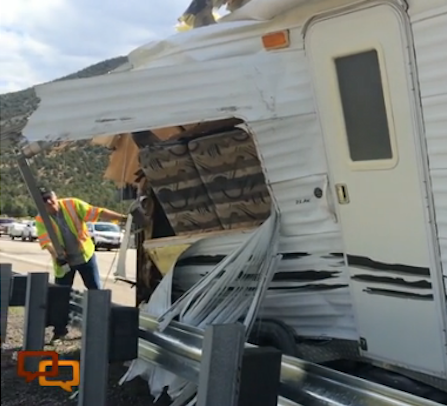 Seeing the sides of this camper ripped out as if they were made of paper reminds me of how fragile they are. This was my biggest concern when I worried about getting a bigger camper. Having a tent trailer, means that it’s almost impervious to wind. It was even better than my teardrop camper in that respect. 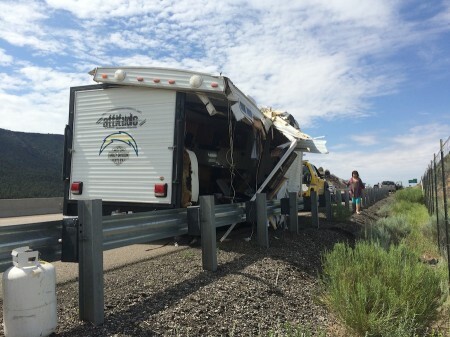 When I see a fifth wheel or huge bumper pull camper being pushed off the road like a toy by the wind once or twice a month, I remember why I put up with popping the trailer every time we camp and I’m grateful.